Hall Of Fame - Spice Girls! It's week 7 of hall of fame and we're focusing on the Spice Girls! 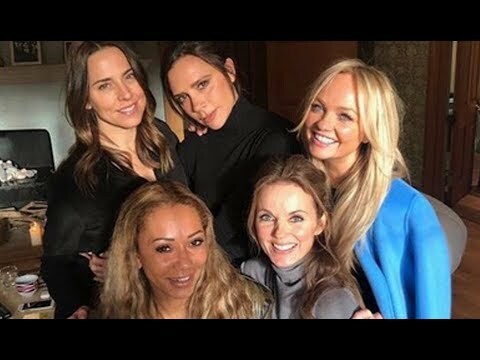 Big in the 90s, Pop girl group the Spice Girls composed by Melanie Brown "Scary Spice", Melanie Chisholm "Sporty Spice", Emma Bunton "Baby Spice", Geri Halliwell "Ginger Spice" and Victoria Beckham "Posh Spice" signed to Virgin Records in 1996 releasing their hit single "Wannabe". Their single was number one in thirty seven countries and granted them their success globally. "Spice" their debut album sold 31 million copies worldwide, making it the best-selling album in female group history. To this day the Spice Girls have sold over 85 million copies worldwide and are a recognisable face of youth culture in the 1990's. The girlband was created through Heart Management's team who wanted to great a girl group to compete with the likes of Take That and East 17 who were also big in the 90s. An advertisement was put in The Stage magazine in February 1994 asking for girls to audition to join the band at Danceworks Studios. On the day, Almost 400 women showed up to audition, They were split up into groups of 10 and asked to dance. After that, they were accessed vocally in solo auditions. Amongst the 12 ladies who made it to the second round of auditions were Victoria Beckham, Melanie Brown, Melanie Chisholm and Michelle Stephenson. Geri Halliwell, who missed the first audition in February, was also at the second round in April. A week after the second audition, the women were asked to attend a recall at Nomis Studios in Shepherds Bush, they were asked to perform "Signed, Sealed, Delivered" on their own and in a group. Within the session, Beckham (Known as Adams at the time), Brown, Chisholm, Halliwell and Stephenson were selected for a band initially named Touch. After "Touch" was created, the girls began to train and work on their career. During the training period Michelle Stephenson was fired and soon replaced by Emma Bunton (Baby Spice) and the name was changed to "Spice". In 1995 when they signed to Virgin Records, the band changed their name from Spice to Spice Girls due to rapper already using the name "Spice". 1. The nicknames that girls are known by were not their idea and were actually given to them by the top of the pops MAGAZINE, since then they've stuck.